Imagine being at a business conference and you are next up to speak. You are thinking about your PowerPoint when suddenly, a CBS News crew is in your face with cameras rolling. They are asking why your online education company is ripping off students. This recently happened to Apple Co-Founder, Steve Wozniak while attending a conference in Florida. 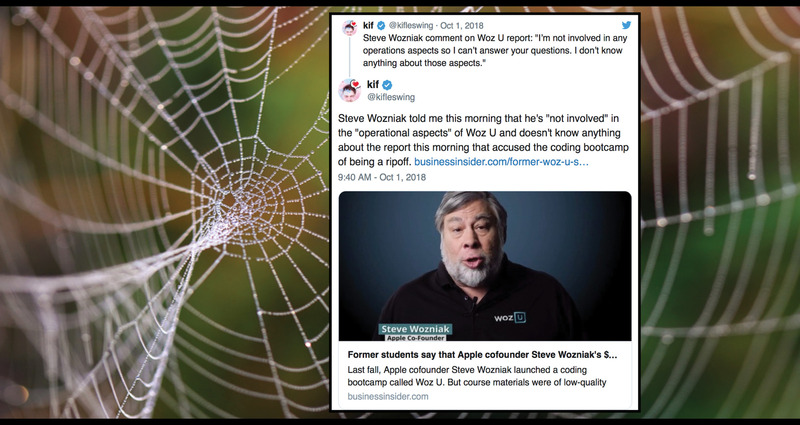 Wozniak did the typical “fly caught in a spider web” act – wiggling, squirming and eventually freeing himself from the news reporter’s “gotcha” web. As with most media ambush interviews, it was an awkward and ugly moment for Wozniak and his organization known as Woz U. 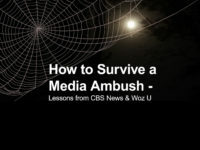 Anyone can survive and even thrive during a media interview ambush with the right spokesperson skills and media training. CBS News says they reached out to Wozniak multiple times to get his side of the story regarding complaints they received about Wozniak’s online education company. Woz U was rolled out last year with great fanfare; the “Wizard of Woz” (aka Wozniak) entered the press room on a Segway. Woz also took to YouTube and other social media sites to tout Woz U as a great opportunity to get the very best computer coding education. For about $13,000 tuition, Woz U promises students a top-of-the-line experience. But, dissatisfied customers say Woz U is not living up to the promises made. As soon as Woz U got wind of student unrest, the organization should have alerted its teams to take corrective action. They should have also refreshed their media training and spokesperson skills to prepare their leaders. When customers failed to get adequate responses from Woz U about their concerns, they did what many disgruntled people do – they turned to the news media to serve as their public bullhorn. The CBS news team pursued this story, most likely because the storyline meets one of the media’s favorite formulas – David vs. Goliath. The plot includes struggling students paying big bucks to get an education from one of Silicon Valley’s gurus. One of the students interviewed by CBS News said it is a classic case of a company putting profits over people – another common crisis storyline that attracts news reporters. If only the “Wizard of Woz” had been wearing some red shoes during this news media ambush, perhaps he could have clicked his heels and been magically transported away. CBS investigative reporter, Tony Dokoupil, approached Wozniak and asked why Woz U leaders had not returned his calls. Wozniak said he had been busy, “I’ve had some calls, but here’s the trouble, I’m in the busy part of a speaker’s life.” Off camera you can hear one of Wozniak’s associates calling for security. Then Wozniak chided the CBS reporter as he walked away from the cameras, “Come on, don’t make statements and pretend like they’re questions.” If Wozniak had been given some solid spokesperson skills coaching or media training, he would have known not to engage in verbal judo with a news reporter. Media ambush interviews attract all kinds of attention from journalists and others. A Business Insider reporter reached out to Wozniak on Twitter for a response to the CBS News allegations. Unfortunately, Wozniak’s Twitter response was also ill-advised, full of defensive language that did not help restore his organization’s reputation and image. Frankly, Wozniak would have been better off with no response than the one he issued on Twitter. Unfortunately, this is what happens when leaders forego spokesperson skills coaching and refresher media training. Some leaders really get too comfortable and believe they do not need media coaching, and it ultimately hurts them and their organization. CBS News said that Woz U President Chris Coleman did respond to them after the Wozniak ambush. Coleman acknowledged errors in the Woz U online course content and says they have implemented a quality control system. Coleman also confirms that Wozniak does review the curriculum. However, he denied another CBS claim that students are subjected to high-pressure sales tactics. A key learning here is that Coleman’s comments will not be heard by the millions of viewers who saw Wozniak dodging the cameras and rushing for cover. Because of the dynamic “gotcha” nature of an ambush interview, Emotional Memory Tags™ are created that embed deep in the crevices of audience memories – making the story much more “sticky” than typical news reports. 1. The best defense is a great offense – You can avoid ambush media interviews by being responsive to news media calls. CBS News had reached out multiple times to Wozniak asking for his response to the allegations about Woz U. By not responding to reporters, you and your organization become more attractive to them. Dodging reporters makes you appear to be hiding something; this is why media training refresher sessions are essential for leaders. Wozniak could have saved himself and his organization much grief by returning CBS News’ phone calls and emails. When you are responsive, you have a wider range of options on how you respond. You close down those options when reporters come hunting for you. 2. The power of nonverbals – Be very mindful of your nonverbal cues. Studies show your nonverbal communication is much more telling and powerful than your words. Your nonverbal cues account for almost 90% of how people perceive your message. Once you find yourself in the midst of a media ambush, do not run or walk away from the cameras. Everything you do communicates! Rushing away makes you appear guilty of something – even when you are not. Just take a deep breath and compose yourself as you settle in and address the reporter straight on. Be kind and be human, because you only get one shot at getting it right during a media ambush. Solid eye contact with the reporter is key, your voice tone should be relational, and your body language should convey openness. If you are wearing sunglasses, take them off. The eyes are often called “the window to the soul”, and sunglasses can make you look like a mobster when reporters have you cornered while firing off all sorts of questions and accusations. 3. Make your words count – Wozniak had so many other better options at his disposal! Instead, he opted for the defense mode. He said was too busy and took jabs at the reporter. Although there are some exceptions, the vast majority of the time these types of actions do not serve a leader or his organization! In an ambush situation a solution-oriented message is always better than nothing. When you look online, it is obvious Wozniak’s team knew about the Woz U criticism. In the world of Twitter, your customers are voicing their opinions daily! This is why it is called “reputation management”. You must stay on top of issues and take action to address operational gaps. It is also essential that you pre-develop messages around various risks and make sure your leaders periodically freshen their spokesperson skills with solid media training so they are always ready and alert. Wozniak should have been armed with a brief statement regarding the Woz U criticism – without granting a full interview on the spot. By saying something, he would have left a very different impression! He could have also asked the reporter to speak with one of his team members to schedule a time to discuss the story. If your organization avoids media inquiries, you must understand the odds are increasing that your leaders will be subjected to a media ambush. Preparation is always the key for a successful outcome with the media and stakeholders! Unfortunately, many organizations fail to dedicate the time required to cover their reputation bases with risk assessments and media training. I know of CEO’s who have been ambushed at their homes and businesses by reporters, citizen journalists and NGO representatives. With the bullhorn of social media, the ambush media interview is also morphing into another kind of beast. In recent months you have witnessed an increasing number of incidents where activists and NGOs are ambushing politicians and others in all types of public places – all with cameras rolling to capture the harassment for social media. This is the reality of our times. It is the reality of the risks you must identify and manage daily to protect your reputation. Thanks so much for reading our blog. We hope you find Benchmark Communications’ reputation management insights very useful! If you would like to subscribe to our Blog just provide your email on the upper right-hand corner of this page. Benchmark Communications’ crisis consultants have helped Fortune 500 groups and others address a range of issues: food contamination, class action lawsuits, activist protests, government investigations, pipeline explosions, competitor meddling, mass killings, union issues, environmental disasters, E coli outbreaks, industrial accidents, oil spills, regulatory issues, chemical releases and much more.